For me, every day is about food. I plan my menu at least a week in advance according to the weather and the activities that grace my calendar. This is no different as the Holidays approach – in fact its even more of a priority. As I look toward that fabulous day of feasting that is known to us all as ‘wear your fat pants day’, I have to keep a little bit of simplicity on my list for my own good. 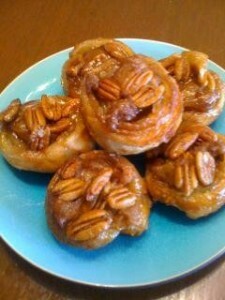 (Enter, Pecan Sticky Buns) Super simple, super tasty, super toss-in-your-purse-able (as long as you put them in a bag or wrapper. Because if you don’t, well, that’s gross. )You can even make these on Tuesday or Wednesday, so that you are free to entertain or cook or plan your shopping trip. With all of the guests and the green bean casseroles bouncing around, you will be glad to have something that takes little effort, but looks like a pastry chef appeared in your kitchen. Also, if you may possibly be one of the crazies who flits about the city in the wee morning hours of Black Friday (still wearing your fat pants) you will need something to sustain you as you stand in yet another line. Here, again, its good to have a plan — not just a map of the mall or aisle numbers at Kmart. You need to know what you are going to snack on so you don’t make that fifth Starbucks run and add on a breakfast sandwich and spend all of your holiday cash on lattes and ham and cheese biscuits. What you need: muffin tin, cookie sheet, 2 tablespoons flour, rolling pin, either a stand mixer with a paddle attachment OR a mixing bowl and hand mixer. 400 degree oven. Start by mixing the butter and sugar in your mixer/bowl. Drop a few pecans in each cup and top them with brown sugar-butter mixture. At this point, you only have butter, pecans and sugar in 12 little muffin cups. Not very impressive. But wait. There’s more. Use your 2 tablespoons of flour to flour a clean flat surface. The puff pastry comes in two sheets. Roll them out one at a time with the folds going left to right. Don’t roll them super thin. Just enough to keep it together nicely instead of having clearly folded sections. Start on the second set of ingredients listed above. Using your fingers or a pastry brush, cover this puff pastry with ½ of your melted butter. Sprinkle on brown sugar and cinnamon. *You may add additional nuts or raisins at this point if you feel like that is necessary. * Now roll this baby up. Starting with one edge, and moving your fingers back and forth across the length of the dough as you roll, as if you are playing the piano from one end of the keyboard to the other. Keep rolling until you have a nice little log of sugary cinnamony buttery pastry. Use a knife and cut in half. (Now you have two shorter logs) Cut each of the shorter logs in three equal parts – now you should have six pieces each about 1 ½ inches wide. Repeat this process with the second folded puff pastry (add a tiny bit more flour if you dough is sticking to the surface). Place each piece (there are 12 now) in a muffin cup spiral side up. They will look like smooshed little cinnamon rolls in muffin tins. And you will be happy about this. For safety reasons, because you want to prevent fires, place the muffin pan on a cookie sheet before you put it in the oven. Bake these babies for 30 minutes. The buns will have turned a lovely golden color and will be firm to the touch. Allow them to cool for 5 minutes, then turn the muffin pan upside down and ease them out of the cups using a spoon. Let them finish cooling on to the cookie sheet or parchment paper. Take a little time, before your hectic season begins, and think thankfully. Grab your coffee and your Bible (and a sticky bun, if you like) and think on the things of the Lord. Look, for just a while, at Psalm 100. Read it. Then read it again. Let the words take up residence in your thoughts as you go about your busy-ness. The Lord is good – and we are his.